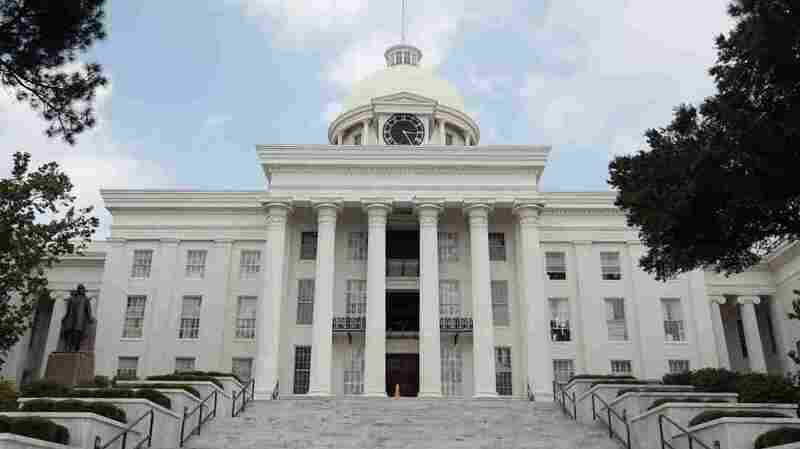 Ala. Racist Language Measure Draws Unexpected Foes Alabama voters decide Tuesday on a measure that would remove Jim Crow-era language from the state constitution. Republican leaders say the language is an embarrassment that deters jobs and investment. But Alabama's black leaders are against the fix, arguing it's a trick to undermine public school funding. State-mandated segregation is a thing of the past in Alabama, but the state's antiquated 1901 constitution paints a different picture. On Tuesday, Alabama voters will decide whether to strip language from the state's governing document that calls for poll taxes and separate schools for "white and colored." In 2004, voters rejected an amendment to purge those remnants of Jim Crow from the constitution by fewer than 2,000 votes. "I think that was a black eye for the state," says Bryan Taylor, a Republican who chairs the Alabama Senate's constitution and elections committee. "Nationally, that was perceived as, 'There goes Alabama, voting down language to reverse its black mark in history.' "
Taylor says that perception hampers the state's drive to attract business, so lawmakers are again putting forth a constitutional amendment, Amendment 4, to delete the now obsolete segregation-era language. "We've got to move forward, to put that behind us," Taylor says. "This is a way to symbolically show the rest of the nation, and the rest of the world, that Alabama's past is not our future." Republican Gov. Robert Bentley also favors the change. "I'm very much for taking the racist language out of the constitution," he says. But even with the support of the state's Republican leadership, the vote is not as straightforward as it appears. There's been a surprising backlash against the amendment from unexpected quarters. The state's teachers union, the Alabama Education Association, is fighting the amendment, as is the state's powerful black political caucus, the Alabama Democratic Conference. "It's a hoax on the people of Alabama. It's a wolf with sheep's clothes on," says conference Chairman Joe Reed. "I mean, who's worried anymore about some racist language in the constitution? That's symbolic. It doesn't mean anything now." The words have no effect, Reed says, in the wake of landmark civil rights cases dating back to Brown v. Board of Education, the 1954 Supreme Court ruling that outlawed segregated public schools. The problem with the amendment, Reed says, is that it would reinstate language added just after Brown v. Board of Education that was later struck down by the courts. That language, added as Amendment 111, declares "nothing in this constitution shall be construed as creating or recognizing any right to education or training at public expense." At the time, it was intended to supersede the Alabama Constitution's original guarantee that the "legislature shall establish, organize and maintain a liberal system of public schools." Now, opponents fear that passage of Amendment 4 will free the Legislature to slash funding to public schools as the state faces budget shortfalls. "What this amendment sets out to do, is ... it makes it easier to return back to the days of segregation, when we had no rules requiring blacks and whites to attend school together," Reed says. Republican leaders deny Amendment 4 is an attempt to undercut public schools. The dispute underscores Alabama's complicated and unwieldy constitution. With more than 850 amendments, it's among the longest in the world. The charter was created in 1901 to disenfranchise blacks and poor whites, centralize power and make it really hard to raise taxes. This latest amendment has split constitutional reform advocates. One, historian Wayne Flynt, a professor emeritus at Auburn University, says the focus in Alabama should not be on outdated racist words but on the underlying policy. He doesn't buy the argument that the language is a "horrible embarrassment" to the state. "I am just astounded at everybody getting all exercised over the wording of the original document in 1901, that we have a segregated school system and poll taxes and all that," Flynt says. It would be a much greater embarrassment, he says, to have to tell foreign investors, "Oh, by the way, we don't guarantee your children a right to a public education in Alabama." The question now is whether Alabama voters will see Tuesday's vote as a referendum on outdated racist language — or the future of public schools. Early versions of this story incorrectly said the Brown v. Board of Education decision was in 1956. It was in 1954.